Soldiers on parade, c1903 Boer War. 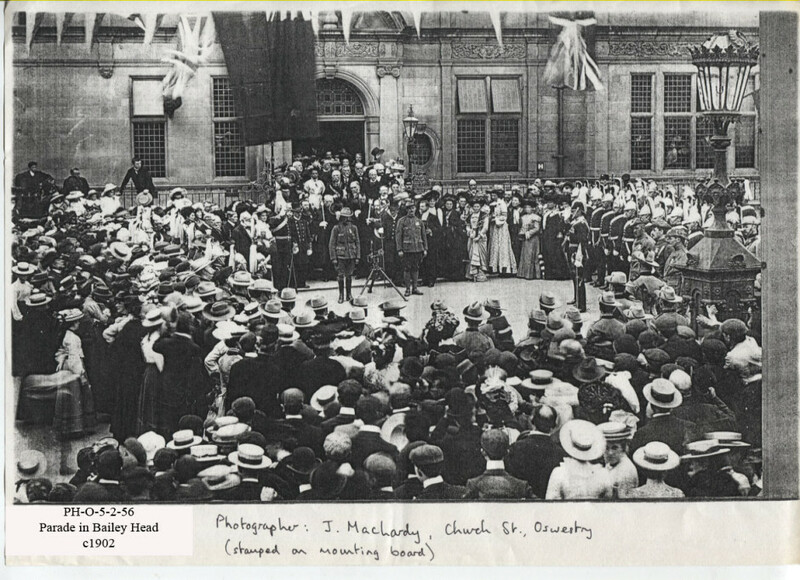 This is the parade presenting the Boer War Maxim Gun to the people of Oswestry who raised the money to buy it. Does anyone know what happened to the Boer War Maxim Gun that was presented to Oswestry in 1903, having originally been paid for by the people of Oswestry. Newspaper reports from 1903 state that the Gun, was returned to Oswestry having been taken back from the Boers who captured it. The plaque is in the Guildhall, but sadly in a rear corridor were it is difficult to see. I hope to be able to post photographs of it soon. The people of Oswestry raised £638 2sh 6d (today = £36,461) to pay for the gun plus approx £1200 (today = £68,472) in War Relief funds. A full list of all 120 men then follows. The Oswestry and Border Advertiser printed this in March 1903. “Gun and Tablet” – “The Committee met on February 24th, and reported that tenders for the erection of a tablet in the Guildhall were received, and that the tender of Mr A Lashmore to supply same, at £47 10sh, was accepted”. (Today = £2710.35p). Directory J MacLardy Photographers First listed in Kelly’s Directory for Oswestry in 1885 at 6 Church Street. Listings found in 1900, 1905, 1913, 1920 and 1922. No Listings after 1924.